Don't tell New Edition fans to "Cool It Now" — they have every reason to be excited to see the new BET biopic about the '80s male vocal group. 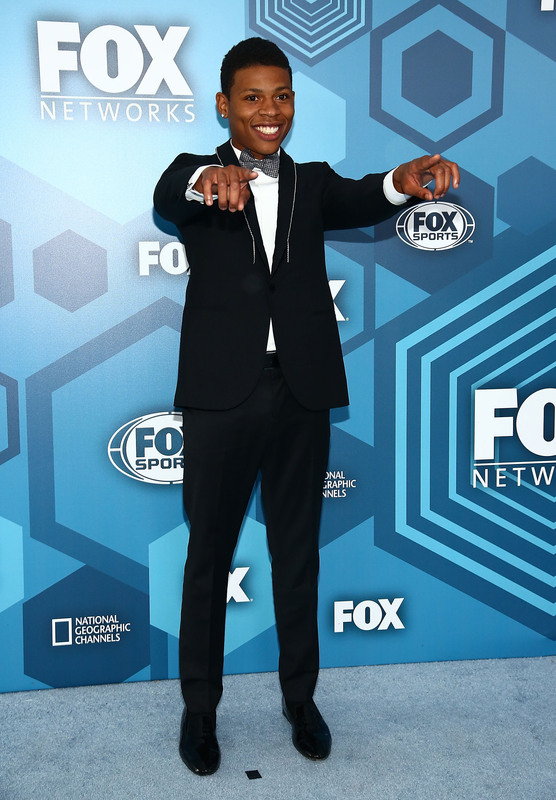 According to Billboard, cast members of this upcoming miniseries, including Empire's Bryshere "Yazz" Gray, will be appearing at the 2016 BET Awards on Sunday, June 26. But when will the BET New Edition biopic come out and grace fans' TV screens? According to Entertainment Weekly, the three-part miniseries, called New Edition: The Movie, will be released sometime in 2017. That could mean a pretty long wait, but I'm sure it'll be worth it. For now, at least viewers will get a taste of the New Edition: The Movie cast at the 2016 BET Awards, where actors Gray, Elijah Kelley, Luke James, Algee Smith, Keith Powers, and Woody McClain will present an award at the Microsoft Theater in Los Angeles. According to The Hollywood Reporter, the upcoming biopic is a big first for the network, as the miniseries is BET's first music-focused scripted TV movie. New Edition: The Movie will focus on the humble Boston beginnings and rise to fame of band members Michael Bivins (Gray), Ricky Bell (Kelley), Johnny Gill (James), Ralph Tresvant (Smith), Ronnie Devoe (Powers), and Bobby Brown (McClain). For those who need a refresher, New Edition is the '70s and '80s boy band that's famous for songs like "Cool It Now," "Mr. Telephone Man," and "Candy Girl," along with launching the solo career of Brown, who was voted out of the group in 1985. They paved the way for modern male vocal groups like One Direction, 'NSync, Boyz II Men, and the Backstreet Boys, so a movie focusing on the group's beginnings and legacy will certainly be interesting. BET announced that the movie was filming in Los Angeles in May, and that a number of other big names have been cast in the film, including Duane Martin (Real Husbands of Hollywood), Michael Rappaport (Justified), and Yvette Nicole Brown as Bivins' mother Shirley. But for awhile, there was one key person missing. When the project was announced in summer 2015, it was widely reported that the miniseries was being co-produced by all of the real-life bandmates, except for Brown. Last October, Brown told Bevy Smith on Sirius XM Radio that he opted out because he wanted to see their story as a feature film. "I think our story is way bigger than N.W.A. 's and they went feature film," Brown said. "I'm looking forward to seeing the movie without me. I'm working on my own thing right now, but BET — I wish them the best. I hope it comes out right and they are able to tell the story without me." But just one month ago, Brown posted an Instagram photo of a chair with his name on it from the set of the movie. and Brown has publicly posed for photos with McClain, who is playing him in the film, according to The Daily Mail. Brown is also now listed in the credits as a co-producer in all of BET's press releases about the movie. So what made his involvement happen? There's no official word if Brown had a change of heart, but it looks like the entire band is back together to make this biopic happen and I can't wait to see it.